While South Africa is, this year, celebrating its hard-fought 20 years of democracy, it has also experienced a substantial increase in infrastructure projects, namely the construction of the Gautrain system, the Rea Vaya Rapid Bus Transit System in Gauteng, the world cup stadia across the country, the King Shaka International Airport in KwaZulu Natal, the Nelson Mandela Bridge in Johannesburg, De Hoop Dam in Limpopo and the Medupi and Kusile Power Stations that add power to the national grid and many more impressive infrastructure projects. Nationally, the country is seeing a call for collaboration, which will boost infrastructure development. During his inauguration speech in 24 May 2014, President Jacob Zuma reiterated that the National Development Plan prioritises the national infrastructure development programme. “We will continue to build schools, railways, ports, universities, clinics, colleges, power stations, broadband, roads and more infrastructures around the country. This programme will continue to be the flagship of government,” President Zuma said. “The willingness of the private sector to engage with government around speeding up infrastructure delivery is very clear; there are many initiatives. The Business Leadership of South Africa has created a working group that is interacting with government. 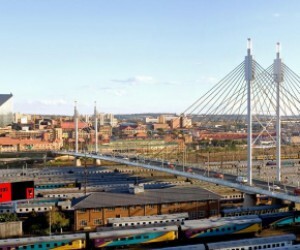 Everybody is very excited, it is clear everybody needs a new way infrastructure can be delivered,” said Ketso Gordhan.